/ Are Havanese Good Swimmers? 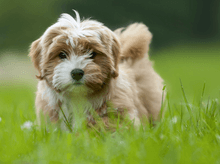 If you live near a lake and you are a Havanese owner, it is very natural to wonder whether your Havanese is born to be a good swimmer so that you can let your Havanese have some fun in the lake. Not only that I am going to explore on this question in this blog post, I am also talk about some interesting things about dogs and swimming. Let’s get started now. Generally speaking, most Havanese are born to be good swimmers. Be careful with the interpretation though. That simply doesn’t mean that you can put your Havanese into the lake and expects him or her to swim. What I mean here is that it is easy for Havanese to learn how to swim. You do have to start with some shallow water where you and your Havanese can safely swim together. Slowly let him get used to the water and he will gradually learn how to swim. By the way, one very nice thing about teaching your Havanese how to swim is that they are so light that it doesn’t take you too much effort to pick them up from water. There are two different theories that explain why Havanese are generally good swimmers. The first one is boring reason, which is simply because of luck. The second theory is a beautiful story which is the one that I prefer to believe. The story goes like this. Havanese are believed to be first found in Cuba many years ago. They traveled to other countries by ships so they now spread all over the world. It is believed that their ancestors do swim in the sea a lot. The instinct is carried by the gene generation after generation. Some big believers of Darwin’s evolution theory even believe that the Havanese that can swim are the ones who have a bigger chance to survive back in the days and that’s why most of the next-generation Havanese have gene that make them better swimmers. Are Most Dogs Good Swimmers? Okay, now you know that your Havanese is a good swimmer which means it usually takes very little effort to teach your Havanese to swim. You may be wondering whether every dog is a good swimmer. The truth is that your Havanese is one of very few lucky ones that are good swimmers. There are two other categories of dogs beside the good-swimmer group. The two categories are the dogs that can be taught to swim, and the the dogs that you shouldn’t let them swim. It seems like that dogs are unlike human when it comes to swimming. While most human regardless of race are decent swimmers, some dog breeds just have body types that don’t allow them to easy stay afloat when they are in the water. I think it is worth mentioning that although Havanese are generally good swimmers, there are exceptions. Just like the fact that most people are decent swimmers, you should know some friends that simply cannot swim. So, don’t force it if your Havanese can’t swim. It is okay to stay on the ground. Being able to swim simply gives them another type of exercise and entertainment. There are 3 good tips that I want to share you on how to get your Havanese started with swimming. These tips are actually applicable to other dog breeds too. It’s just that it is much easier for Havanese to learn swimming generally. In my opinion, the safest way to get your Havanese to start learning how to swim is to get into the water yourself with your Havanese. That way, if Havanese really happens to be the unlucky ones that are bad natural swimmers or they simply are not used to the water yet, you can always hold your Havanese with your arms and keep him safe. To kick start the learning process, you would like to hold your Havanese gently so he is afloat in the water. Very likely, it won’t take long for your Havanese to know how to swim without you holding him. If you don’t like the idea of getting into the water with Havanese for some reason, you can take your Havanese to some shallow water where you can easily grab him and take him out of the water in case anything happens. Let your Havanese where a life preserver so he can be kept afloat even if he doesn’t know how to swim yet. The point is to let him get used to the water and it also allows you to observe whether your Havanese is scared of the water. When it comes to training your Havanese, including teaching him how to swim, group learning is actually a very effective way. What I mean by group learning here is to simply put your Havanese into the water where some other dogs are swimming nearby. You will have to use this tip with either tip #1 or tip #2, meaning that you either have to get into the water yourself to keep your Havanese safe, or you have to let your Havanese wear a life preserver and put him in area where you can quickly grab him out of the water and keep him safe when needed. It is always good to be a little too safe than to be a little too risky. Until you are sure that your Havanese has become a great swimmer that is very safe to swim, you want to have him always wear a floatation vest when you take him to the lake or the beach. You also want to be in the water with him most of the time. That’s not for safety. That’s also for building your relationship with your Havanese too.